A camper boat top turns your open boat into a snug cabin on the water, providing shade and protecting you and your passengers from wind and rain. 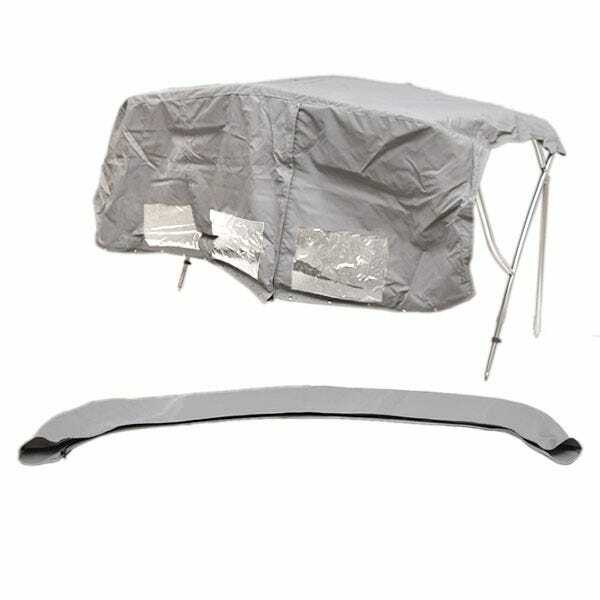 For a quality OEM boat camper top at a closeout price, shop Great Lakes Skipper. Our inventory of thousands of new and replacement boat parts includes a huge range of pontoon boat camper tops, bimini camper boat tops, stainless steel frame boat camper tops, aluminum frame boat camper tops, boat camper tops with windows, and more. Shop our site for outstanding savings on discount boat camper tops by Glastron, Triton, Bayliner - Brunswick, Sea Ray, Taylor Made, Larson, Tracker, and more top brands. To determine which boat camper top is best for your application, simply choose the length/depth (front to back), height, and width that best accommodates your boat and your requirements. The height as well as length/depth determines how much shade your camper top will provide. Also consider the coverage area when the top is deployed or opened and where it falls when it's closed and folded down at the rear of the boat. Remember to ensure that there is enough space in front of and behind the deployed top to mount eye straps to secure the hold-down straps.